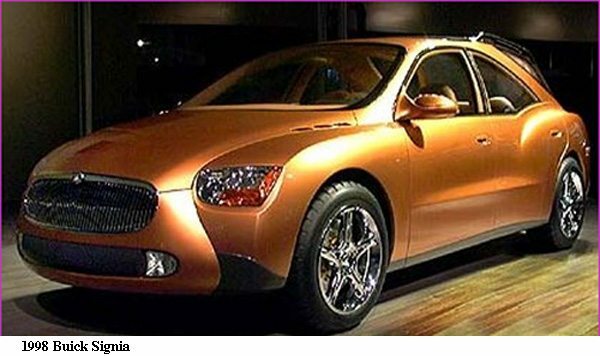 This is a concept multiple-activity vehicle that offers the versatility of a van or sport utility while retaining the comfort, convenience and safety of a premium family sedan (it’s based on Park Avenue architecture). Signia is taller, somewhat wider, and significantly shorter than the Park Avenue. It also has higher seats and roof as well as inset rocker panels for easier passenger access. Cargo space is enhanced by independently folding seats and a powered rear floor that extends 15 inches out the back. Large rear doors, with 90-degree opening range, also provide easy cargo access. A hinged, composite-plastic hatch functions as sunroof and outside cargo carrier and is removable for transport of bulky items. Infrared sensors detect objects in the blind spot and trigger warnings displayed in the outside rear view mirrors. In front of the driver’s seat are reconfigurable head-up and head-down animated color displays. The remote keyless entry fob can be used to provide Personal Choice settings for seat positions, climate controls, entertainment sound systems and the tilt and telescoping steering wheel. The engine is a 240-horsepower supercharged 3800 Series II V-6. An innovative hybrid all-wheel-drive system controls torque based upon wheel speed sensors monitoring traction needs. The color is described as metallic-ochre.